Architecture AF were tasked with the office design for mobile gaming app company, Dots, located in New York City, New York. Originally built in the 19th century as the Collier’s Printing House, the historic building now known as the Greenway Mews has undergone many transformations in Manhattan’s Meatpacking District. Currently a popular home for tech companies, the building offered an ideal headquarters for a mobile gaming app company. With a diverse team of illustrators, animators, designers, and engineers all working under the same roof, the client brought a full program to the 5,400 sf raw space – including individual workspaces, a gaming area, conference rooms, phone booths, a sound studio, lounges, and impromptu “breakout spaces” to name a few. To organize the program, we took cues from the long, rectilinear space, grouping the program into three “bands” aligned parallel to the length of the space. The first band is comprised of individual desks, flanking the only wall with windows -maximizing daylight for each employee. All service oriented program -reception, kitchen, storage, etc. – is arranged parallel and opposite to the open workspace, along the length of the hallway. Separating and mediating these two bands is a series of interstitial mixing spaces designed to encourage interaction between employees. A restrained material palette of plywood, blackened steel, and grey felt cohere the architectural interventions. Two felt wrapped rooms with bleached plywood slats are inserted into the space, offering private conferences and phone booths on the interior, as well as a sound dampening exterior for the cavernous office. Additional breakout space such as lounges and cafe tables, a gaming center, and banquet areas offer flexible usage – from lunch to casual meetings. 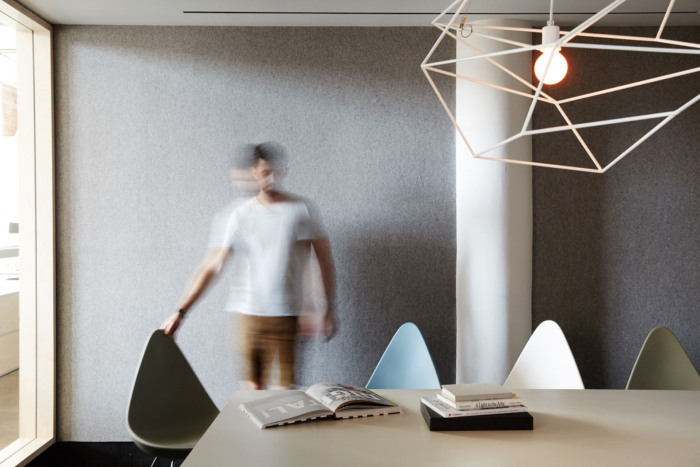 Natural and soft materials create a warm and soothing office environment, and their understated use reflects the values of a startup inspired by minimal design.